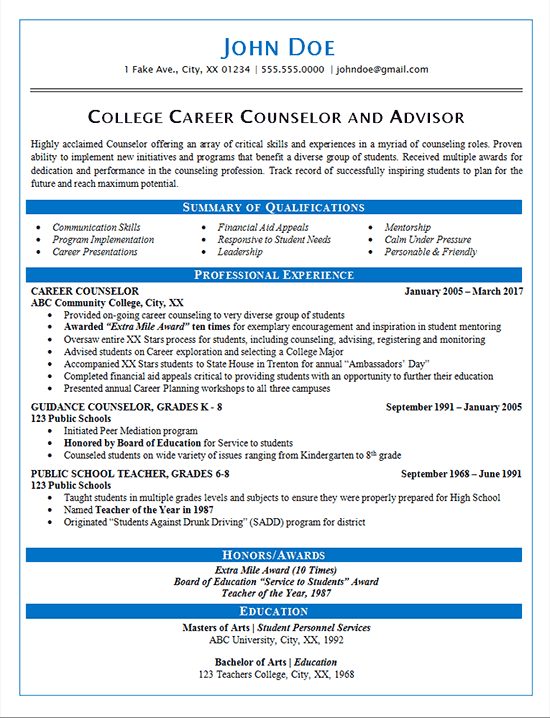 College Career Counselor Resume Example is for a professional that has over twenty-five years in his field. This individual is semi-retiring but wanted to keep his options open in case the right opportunity came up. The Summary of Qualification section was designed to highlight critical traits for a successful counselor as well as specific skills that he brings to the table. In the Professional Experience section, bullet points with Honors or Awards were typed in bold to make sure that they stand out. With someone with as much experience as this client, it would’ve been easy to include far more bullet points for each position. However, the decision was made to highlight the important points and keep the resume to one page. The Honors and Awards speak for themselves in terms of verifying that this client is a highly effective counselor. Next, an Honors and Awards section followed to ensure potential employers were aware of his accomplishments. Finally, education degrees were listed at the bottom of the resume to demonstrate his qualifications. Highly acclaimed Counselor offering an array of critical skills and experiences in a myriad of counseling roles. Proven ability to implement new initiatives and programs that benefit a diverse group of students. Received multiple awards for dedication and performance in the counseling profession. Track record of successfully inspiring students to plan for the future and reach maximum potential. Provided on-going career counseling to very diverse group of students. Awarded “Extra Mile Award” ten times for exemplary encouragement and inspiration in student mentoring. Oversaw process for students, including counseling, advising, registering and monitoring. Advised students on Career exploration and selecting a College Major. Completed financial aid appeals critical to providing students with an opportunity to further their education. Presented annual Career Planning workshops to all three campuses. Honored by Board of Education for Service to students. Counseled students on wide variety of issues ranging from Kindergarten to 8th grade.